Amazing Spider-Man 195 Cover SOLD SOLD SOLD! Click Here To See Amazing Spider-Man #195 Comic Book! WOW! Not many times will you have the opportunity to own such an HISTORIC 1970's bronze age "AMAZING SPIDER-MAN COVER! This cover from the story titled: "Nine Lives Has The Black Cat!" 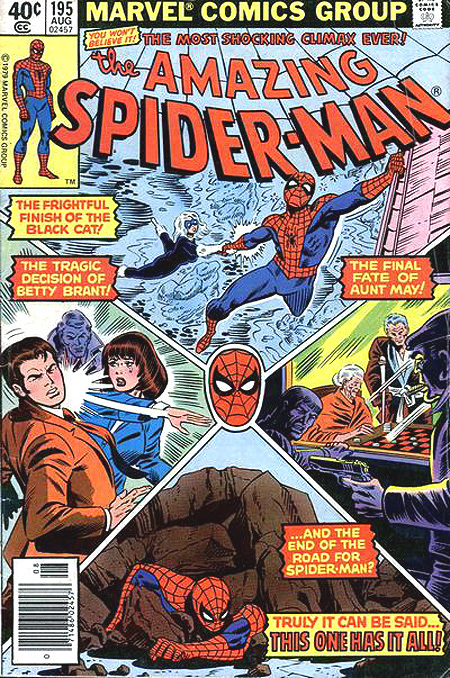 features Spider-Man saving The Black Cat at the top, then peter Parker is getting SLAPPED by Betty Brant, then we see Spiderman trapped under rubble at the bottom, and finally we see dear old Aunt May at the nursing home to the right! The infamous Burglar who killed Uncle Ben in Amazing Fantasy #15, as well as Mysterio in his civilian identity are also shown in same scene! SWEET! Just a lot of drawn artwork on this great cover which has been in a private collection for over 25 years...UNTIL NOW! 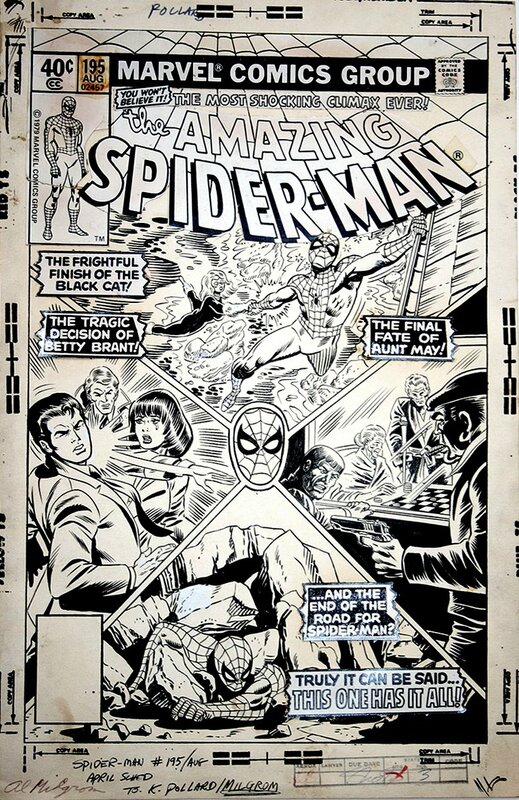 This RARE "AMAZING" Spiderman Cover was drawn by the VASTLY under appreciated and VERY skilled hands of KEITH POLLARD, and inked by the great Al Milgrom! DO NOT pass this one up if you can help it! Compare this nice cover art to the published comic book in the red link above! ALL HIGH end pieces of art, including this one, are able to be purchased with VERY fair time payment plan options, and trades are always considered towards this and any other pieces of art on my site here! Just send me an email and we can try to work something out.